Hainan is China’s smallest province by land mass, though it still covers a vast area, as it includes an estimated 200 islands scattered over three archipelagos off China’s southern coast. 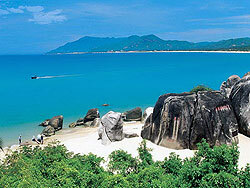 Hainan has no cultural wonders, but an awe-inspiring natural beauty that earns it the nickname “the Oriental Hawaii”. Its great weather and hospitable people have attracted those who want to retreat into nature, meander about on its beaches, swim and take in its sumptuous seafood dishes. Hainan’s kind-hearted villagers treat visitors well, offering them traditional cuisine, and giving them a taste of local song and dance. The Li and Miao Villages in particular are well-known for their friendliness. The city of Haikou, towards Hainan’s north, is the province’s cultural, political and economic capital. The popular Southeast Asian dish, Hainan Chicken Rice, gets its name from this region. But do not ask for it when you are visiting Hainan as it is almost completely unknown there.